The best beer is worth traveling for. And with all the local breweries, pubs, festivals, and cultural practices that make beer tourism throughout the world great, it’s never been a better time to explore. Drink your way around the world with our guide to the best cities for ale, stout, lager, pilsner, and more. Between the low-alcohol beers made in local abbeys and the innovative craft brews of more recent years, Belgium has cultivated a unique mix of laidback café culture and beer snobbery. Belgian beer is served in special glasses, like chalices and snifters, specifically designed to maximize the taste of each brew. Head to the Museum of Belgian Brewers in Brussels to learn all about brewing, serving, and tasting. Whether you enjoy your moules frites with Chimay, Duvel, or the coveted Saint Sixtus of Westvleteren, you’ll be glad you made the trip. Famous for beer that’s cheaper than water, Prague is a must-visit city for any beer connoisseur. Brewing was first recorded in the region in the 10th century, and Czechs are now the biggest beer consumers in the world per capita. Be sure to visit U Fleku, a microbrewery, bar and restaurant that’s been serving the same famous dark lager, exclusively available here, for over 500 years. Pilsen, about an hour outside Prague, is the birthplace of pilsner pale lager. At the Pilsner Urquell factory tour, you can try cask-conditioned, non-pasteurized beer similar to the 19th century version of beer. Beer is integral to the cultural and culinary heritage of Munich and the Bavarian region of Germany. And while there are beer festivals all over the world, nothing compares to Munich’s Oktoberfest. During the 16-day festival in September and October, over 7.7 million liters of beer are consumed by nearly 6 million guests. Complete with oompha bands, raucous crowds clad in lederhosen and dirndls, and liter stein glasses of delicious beer, it’s any beer lover’s nirvana. But Oktoberfest isn’t the only time to imbibe in the city’s popular brews. Grab a communal style bench seat at one of the beer halls like Hofbrauhaus, fill up your weizen glass at a biergarten like Hirschgarten, or visit one of the many trendy beer bars throughout Munich. Irish pubs are like Chinese restaurants: you can find them anywhere in the world. But the motherland of these establishments is the best place in the world for a freshly poured stout. Lively pubs around Dublin are the perfect hangouts to wet your whistle while having a craic with locals. After exploring the local haunts, make your way to the mecca: The Guinness Brewery. Tour the museum, learn how the beer is made and make your way up to the roof, overlooking all of Dublin, for the perfect pint of stout, straight from the source. If it’s craft beer you’re after, don’t look any further. With over 70 breweries spread across several neighborhoods, there’s never been a better time to visit Portland. Hop on the Brewvana bus, which hosts tours and tastings throughout the city, or just stop at the many growler-filling stations serving local brews throughout the city. More than 85,000 local brewers and beer lovers alike head to Portland in July for the annual Oregon Brewers Festival, the biggest outdoor beer celebration in North America. But if you can’t make that, there are plenty of other beer-related festivities throughout the year, from the Portland International Beer Festival in June to December’s Holiday Ale Festival. There’s even an organic beer festival in August if that’s your thing. Going to the pub is as British as taking afternoon tea. It’s the heart of U.K. social life. As the birthplace of IPA and porter, London is the perfect place to celebrate England’s brewing accomplishments. The summer is an ideal time to visit, with Food Meets Beer Festival in Borough Market in July, the Great British Beer Festival in Olympia in August and outdoor drinking to be enjoyed at pubs throughout the city. Japan isn’t known for its beer scene, but there’s a lot more there than Kirin, Asahi and Sapporo. Japan, and especially Tokyo, is going through a brewing revolution, bringing lower prices, a greater selection, and tons of craft breweries with it. Crowd-favorite Popeye has nearly 70 varieties of Japanese beer available on tap. Mutuality is important in Japanese drinking culture. Pour your drinking partner’s drinks for him or her whenever you can. Asheville, North Carolina has more breweries per capita than any U.S. city, which is remarkable considering the first one, Highland Brewing Company, opened in 1994. Now, nearly 100 types of beer hail from Asheville. Try some out for yourself at one of the many festivals held throughout the year. The Beer City Festival is held in late spring, Brewgrass marks the start of leaf changing season in early fall, and Winter Warmer comes just in time to warm up all the beer lovers in February. Beer has been a major export since the Golden Age of the Netherlands in the 17th century, with Amsterdam playing a major role in the beer trade. These hops experts are known for their pale lagers and white beers. 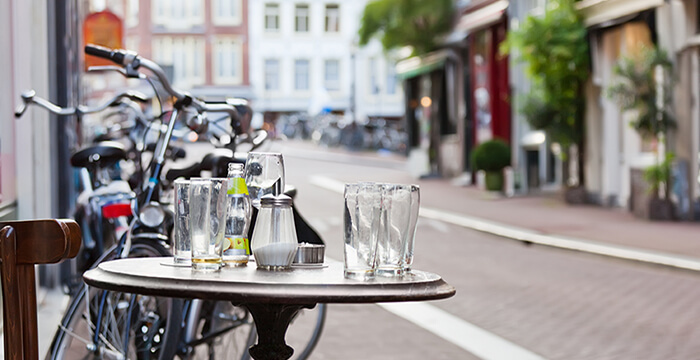 Most cafes only have a few beers on tap, but head to the brewpubs or brown bars, traditional Dutch dive bars, for some unique flavors and characters. For a familiar flavor, don’t miss the Heineken Experience interactive tour in the Heineken factory, still operating since its founding in 1864. Need something to wash down your poutine? Montreal was the site of Canada’s first commercial brewery and it’s been flourishing ever since. In addition to the classic Molson and Labatt beers, there are now more than 25 breweries creating craft varieties. Visit the city’s crown specialty, Dieu du Ciel, which was one of the first places in Montreal to serve handcrafted beers. Other great watering holes include the retro Le Cheval Blanc, live music hotspot Vices & Versa, and Benelux, which is located in an old bank. Celebrate summer with hundreds of international beers, Canadian brews, events, seminars and pairing workshops at the Mondial de la Biere festival in June. For more culinary-inspired travel, check out our Chocolate Lover’s Pilgrimage.